Address: 445362 Samarskaya obl., Zhigulevsk, pos. Bakhilova Poliana. Zapovednik Zhigulevsky in the center of Samarskaya Region, was founded in 1966; part of the territory was protected in 1927-1951 and in 1959-1961. The surface area is 23,1 thousand ha. 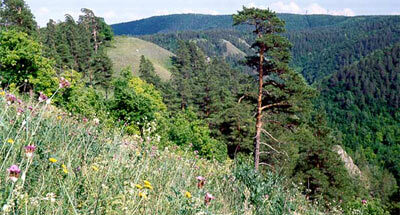 The Zapovednik is located in the northern part of the Samarskaya Luka peninsula, formed by a turn of the river Volga. 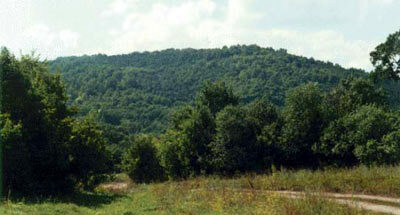 On the south it borders with a National Park "Samarskaya Luka". It includes the central massif of the Zhigulevskye Mountains and Volga's Seredysh and Shalyga islands. 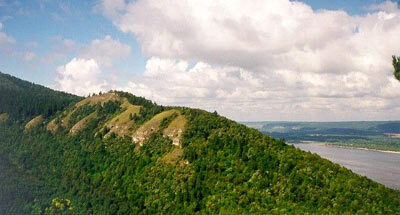 The mountain ridge is cut with wide and narrow valleys into separate massifs. Lime, aspen, oak and pine forests prevail; the bottoms of the valleys are occupied by forests with black poplar, smooth-leaved elm, black alder, and white willow. In steppe pine forests and "stone steppes" on the southern slopes there live most of the Park's relict and endemic species of flora. Vascular plants account for more than 830 species. Two endemic species are met only in Zhiguli: Zhigulevsky spurge, Zhigulevsky mist-grass. Of rare and disappearing species there grow here yellow lady's slipper, Cephalanthera rubra, Koeleria sclerophylla, Globularia punctata and Schivereckia podolica. In the animal sphere are registered 40 mammal species: 158 bird species, 7 snake species and 8 amphibian species. Elk, wild boar, badger, marten, fox, alpine hare, and squirrel are commonly seen; European roe is rare. Of grouse birds there live in the Park the wood grouse, hazel grouse, and black grouse; of waterfowl the mallard duck, goldeneye, and teal nest. Rare bird species are noted: the fish hawk, white-tailed eagle, and golden eagle.